This radical, provocative and inspiring book explores a tectonic shift at the very heart of business. A shift that?s making the old bottom line of corporate profitability the servant of a new master: a new ?person-centric? bottom line of personal profitability or value ?in my life?. So what? No bottom line? No more profit? Of course not! Every organization must cover its costs. Every business has to make a profit to survive. The authors of The New Global Line remarkably show that the necessary requirements for doing so are changing, and why this transformation ? containing important elements of both evolution and revolution ? is under way, how it?s undermining the foundations of once-great businesses and brands, and how its throwing up huge new opportunities. Alan Mitchell is a leading marketing journalist with a track record of challenging writing in a wide range of publications, including the ‘seminal’ book Right Side Up: Building Brands in the Age of the Organized Consumer (HarperCollinsBusiness, 2001). Andreas W. Bauer is Head of Roland Berger Strategy Consultants’ global Consumer Goods and Retail Competence Center. He is a renowned speaker on consumer strategies at industry conferences and author of several books including Success 2000 Plus. Dr. Gerhard Hausruckinger is a partner at Roland Berger Strategy Consultants specializing in consumer-facing industries and co-head of the firm’s Consumer Goods and Retail Competence Center. He is widely recognized as thought-leader for innovative growth strategies in the FMCG industry. Introduction: Designing value around people. The value earth is moving under our feet. Consumer-facing businesses are facing an era of fundamental change: from product-centric to person-centric. Why today's businesses cannot - or do not want to - meet a whole range of crucial consumer needs. Why these same businesses continually neglect - and miss the value - of a whole range of hugely powerful, personal assets. 3. The New Bottom Line. How a need breed of businesses are connecting these value gaps to these untapped assets...to transform the business landscape. How looking at markets, rather than products and services, from the buyer's point of view revolutionizes marketing processes - and its consumer value. How helping people to reach their personal objectives, rather than sell them more ingredients, takes value to a new level. Why helping people reach personal fulfillment will be a massive new business in its own right. 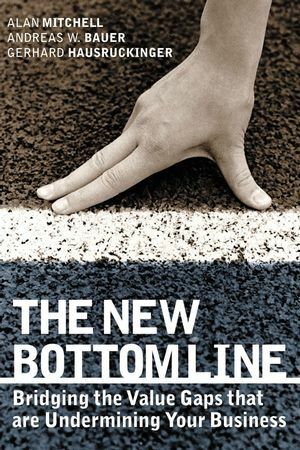 Why, and how, the new bottom line requires the emergence of completely new business models - and why migrating towards the new bottom line is not a matter of choice. 8. Let the customer drive your company - literally. How moving from push to pull adds value while cutting costs. 9. Organize operations around your customer. How the imperatives of customer convenience and corporate productivity connect. 10. Build partnerships around your customer. How the new bottom line involves complete supply chains and value networks, not just individual companies. 11. Become a company that works for me. How the demand for 'value in my life' affects the workplace as well as the market place. 12. Make marketing a service. How to make marketing effective - by freeing it from its seller-centric bias. 13. A New Vision of Value.